Have you dreamed about your special day yet? You have probably experienced some sleepless nights already. A wedding day is very intense for most people. So many things have to be organised in advance. It is not just some casual event that you invite a few best friends to. A wedding day needs to be extensively and thoughtfully planned. In quite detail you have to write down the names of all guests, write down their personal preferences regarding with whom they would like to sit next to at the table. Most importantly though, you have to find the right location for such an event. It is not enough that the room has enough space itself. It is also really important that the location has some sort of outside area as well where the guests can gather to sit back to watch a spectacular fireworks display for example. You might be surprised about the importance of an outside area. Yet, we can assure you that it is really something to experience a wonderful fireworks display at your wedding. Of course such a fireworks display cannot take place inside. Therefore, the right outside area with enough space and perhaps a small river or lake is advantageous. If you then think about other aspects that need to be considered for such an event, you get an idea of how big and complicated it actually is to plan a wedding. There need to be enough food and enough drinks for the guests. Also, it is important to choose the right kinds of food as well. It would be discriminating to only offer meat dishes. You should make sure that you offer vegetarian or even vegan dishes also. Nowadays, there are also quite some diverse allergies that have to be taken into account. Whether it be gluten intolerance or lactose allergies, wheat allergies or citrus sensitivities. The list goes on. You need to check your guest’s health status in advance. To do this with more than 200 people can be quite challenging. Therefore, it can be helpful to order a wedding planner. Wedding planner look after these kinds of things. There are a very big help and should not be underestimated! If you choose your wedding planner you might ask yourself whether he or she is now a skilled wedding planner or not. Of course, you want to make sure that everything goes as planned. Yet, there is no other way to find out, then to give it a shot. Sure you can look at many reviews and testimonials of other people online, yet you never know for sure. This is also the reason why we suggest to not sit there alone and try to manage everything yourself. Go and find some good friends or relatives that might help you with the planning. This can be a big relief. If you plan to integrate fireworks display on your wedding day, then you should especially take your friends’ opinion into account. They should give you some indication regarding the colours and light effects of the fireworks display. Do you choose to rather incorporate red and orange colours into your show or also blue and green lights? What sort of colours does your partner prefer? Of course the fireworks display is not only for you, your partner should also have a right to mention his or her favourite colour combination. Now this can also be quite a challenge. You do not want spoil the surprise of the fireworks display by asking your partner questions about the lights. Therefore, others might want to talk to that person and try to find out more in disguise. Fireworks display without water? Sure, this can also be really pretty and inspiring. Yet, we suggest to integrate some kind of water into the fireworks display show. It is very pretty to see the lights and colours in the reflection of the water during the event. Also water has a calming effect and will amaze your guests even more. If you thought about some other add-ons for your fireworks display, then you might have thought about a bridge or a platform from which you and your partner will glance at the fireworks display. This can really make the scenery even more spectacular. Can you imagine? You and your partner standing on a platform or bridge over the water looking at the fireworks display in front of you while applause and kind words are coming from the guests in the background. What an emotional moment. 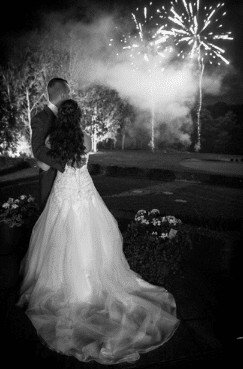 We from Dynamicweddingfireworks.co.uk are well aware of the emotional component of such an event. Therefore, it is naturally for us to really think in advance about your special day. This means that we will be in contact with you quite some time before your day. Making sure that everything goes as planned and that you do not miss a thing. If you are keen to know more about our fireworks display, we encourage you to have a look on our website. Here you will find all information you need for our selection of spectacular fireworks display. You will find all kinds of different fireworks display. No matter what you are looking for, we are confident that you will find the right product among our selection.